Our lecture series featured women speaking about their scientific or mathematical research or presentations of work describing or studying the conditions of women and girls in the science and mathematics work force. All lectures were open to the public and men were cordially invited. Lectures presenting scientific work are hoped to increase networking among women scientists and increase dialog about scientific accomplishments with all members of the Monmouth community. 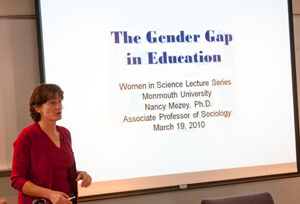 The inaugural lecture was given by Dr. Nancy Mezey, Associate Professor of Sociology, in the Department of Political Science at Monmouth University, entitled The Gender Gap in Education. A pdf file of the slides used in this presentation is available.